Today’s posts are both celebrating a trip I had the privilege of making to Des Moines a few weeks ago for the Farmers Feed US 2012 Iowa CornQuest! Sponsored by the Iowa Corn Growers Association, the trip was a total blast. Loved getting to hang out with some absolutely wonderful blogging friends, learn all sorts of things about the Iowa corn, beef and pork industries and the amazing farmers who work hard to provide for us, and of course — loved getting to eat some seriously stellar food! While we were treated to many delicious dishes on the trip, one of my favorite meals was actually a lunch that we were able to cook ourselves! That’s right. Brave Chef Terrie Kohl from the Country Club Market split the ten of us food bloggers into teams to prepare lunch for one another using her delicious recipes. 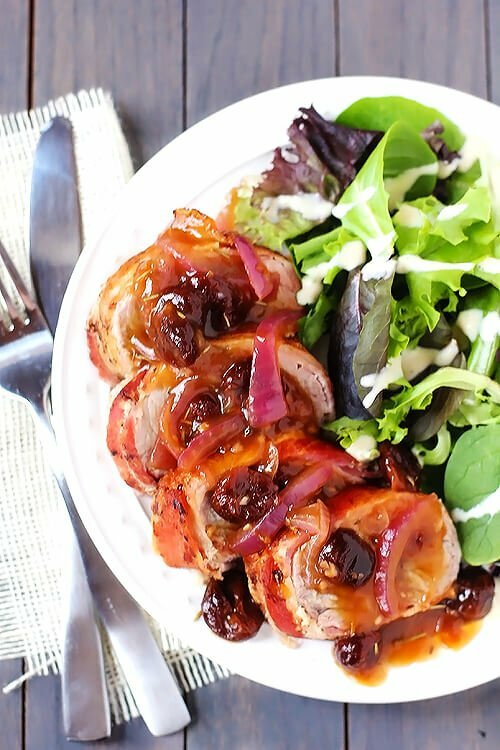 And I was lucky to end up on Team Pork making this heavenly Maple Bacon-Wrapped Pork Tenderloin with Rosemary Cherry Sauce. I think the chef must have secretly known one of my biggest cooking aversions, because she promptly put me to work removing the silver skin from about 8 pork tenderloins. But I admit, it was all worth it when everyone sat down and took their first bites of this pork dish. It was absolutely amazing! Cheers to great meals, grown by great farmers, and cooked with great friends!!! 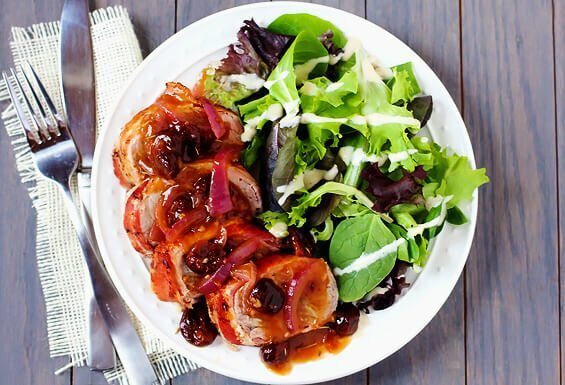 You’ll love this delicious Maple Bacon-Wrapped Pork Tenderloin w/ Rosemary Cherry Sauce recipe! Preheat oven to 375 degrees F. Wrap the tenderloin with the strips of bacon in an even layer, securing with toothpicks. Heat oil in a large skillet over high heat. Then add the pork and sear it on all sides, about 2 minutes per side, until browned. Once seared, transfer the pork to a baking pan covered with aluminum foil (for easy cleanup). Then bake for 20 minutes, or until the internal temperature reads 140 degrees F. (As the pork sits afterwards, it will continue cooking and reach 145 degrees.) Serve pork covered with pan sauce. In the same skillet that you used to sear the pork, heat the olive oil on medium-high heat. Add the onions, garlic, dried cherries and rosemary. Saute until the onions are cooked, about 6 minutes. Add the chicken stock and continue cooking until the sauce comes to a boil. While the broth heats, whisk together the vinegar and cornstarch in a separate bowl. Once the broth is boiling, whisk in the cornstarch mixture until evenly blended. Let sauce boil for an additional 1-2 minutes until thickened, then remove pan from heat and cover until serving. 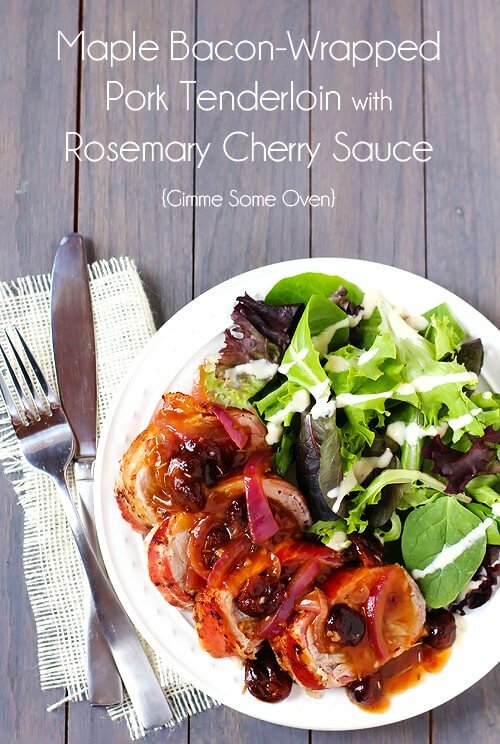 Recipe used with permission from Chef Terrie Kohl.